Royal Flying Corps badge, WW1. A pre-WW1 photograph of the junction of the High Street and Belvoir Road, Bottesford, showing the Raleigh advertising boards on the cycle shop in the right-hand of the cottages. 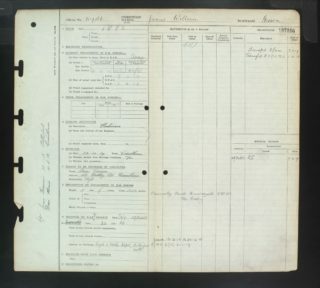 James Geeson's RFC-RAF service record sheet. James Geeson is one of the men named on the Bottesford ‘church organ list’ of WW1 Servicemen. James William Geeson was born in Bottesford in September 1882 and baptised on the 8th of October, son of James Geeson (senior), who was born in Redmile in 1842, and Eliza Geeson (neé Challands), born in Muston in 1850. 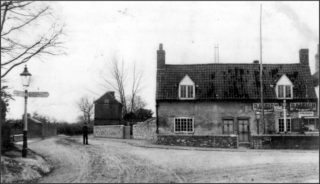 In 1891, James senior was an agricultural labourer living in one of the houses opposite the Red Lion on Grantham Road with Eliza and two children, eight year old James William and four year old Agnes. 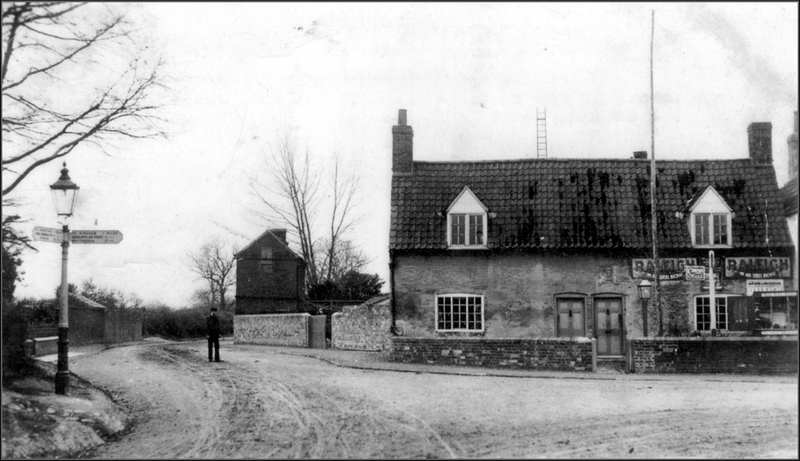 In 1901, the family still lived on Grantham Road in one of the houses opposite to the Red Lion, probably the same as they occupied a decade earlier, next to James Lewty, the watch maker. James senior was a farm horseman, but James William was an apprentice bricklayer and Agnes at work as a dressmaker. In October 1909, James married Amy Mann, who was born in Thames Ditton, Bucks, on April 7th 1888. 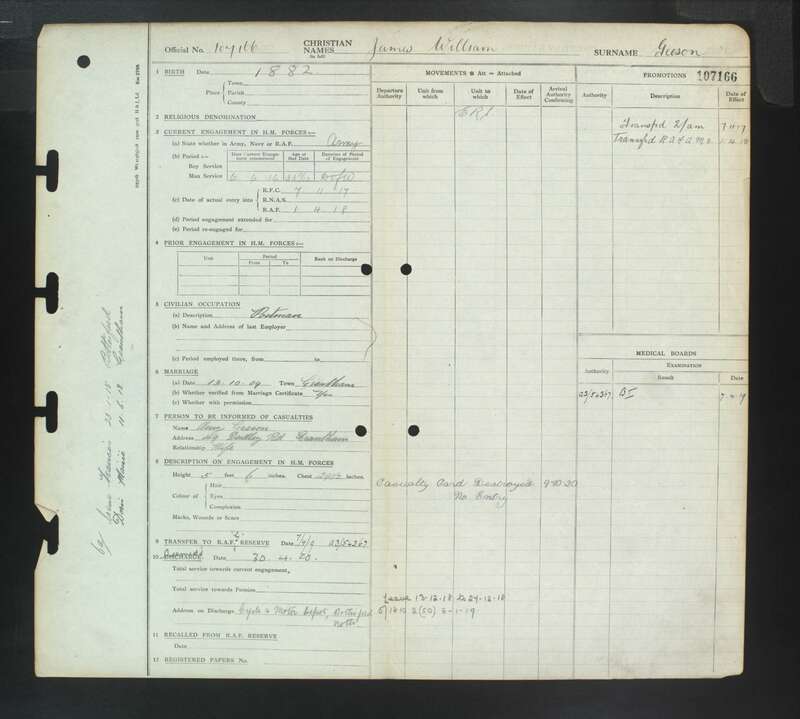 The census of 1911 records James Geeson (senior) as a road labourer working for the County Council, still living on Grantham Road. However, James William, now aged 28, had become a cycle repairer and agent, living at 5 High Street, Bottesford, with his wife Amy. He was named as a cycle agent in Kelly’s Directories of 1908, 1912 and 1916. James and Amy had two daughters, Irene (born January 23rd, 1915) and Doris (born June 11th, 1918). James Geeson had become a village postman by March 1915, when he was accepted for army service, as recorded in his wartime diary by Walter Miller, p.27 (http://ww1waltermiller.co.uk/diary/), though he may not have actually joined the army until the 16th June 1916. 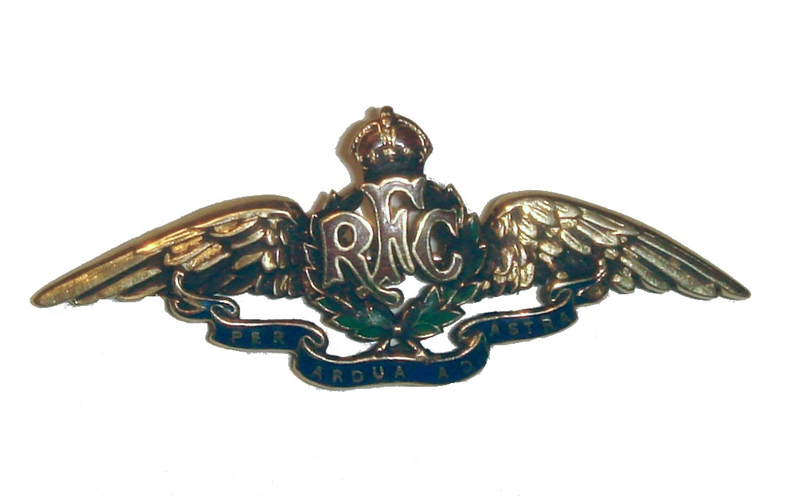 No further detail of this period has been discovered, but he has a RFC/RAF service record in which his transfer to the RFC is dated as the 7th November 1917, followed by transfer to the newly-formed RAF on the 7th April 1919. His wife, Amy, was his next of kin, living during the war at 49 Dudley Road, Grantham, though when he was discharged on the 30th April 1920 his address was ‘Cycle & Motor Depot, Bottesford, Notts’. He served in France from the 22nd February 1917 to the 4th March 1919, and was awarded the Victory and British War Medals. James Geeson was the village postman in Bottesford for some time, recorded at houses on Barkestone Lane and Grantham Road in the 1920s. But by 1931, the Geesons had moved to Nottinghamshire where James continued to work as a postman in Nottingham. The British Postal Service Appointment Book 1737-1969 gives his number as125006. James Geeson, his father, died on the 15th December, 1921. James William Geeson lived to be 71, and died in March 1953 in the Basford area. Amy lived another twenty years, and died in March 1973, aged 84.